Cases of fraud are often encountered on the internet. This happens when a user replies to an attractive offer by sending a payment to fraudsters or giving them access to personal information. Yandex Browser tracks fraudulent sites and blocks them as part of the Protect integrated security system. Yandex keeps track of sites that are linked to internet fraud and phishing and saves their URLs in a special database. 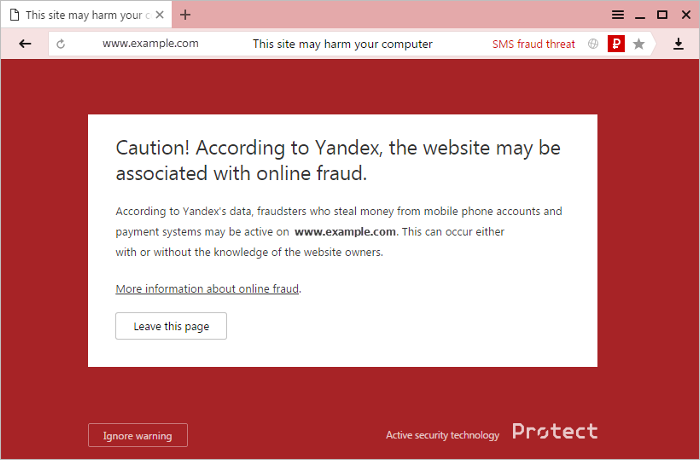 If you try to go to a site linked to Internet fraud, Yandex Browser blocks the dangerous page and informs you about this — a message appears in the browser window, and on the right of the SmartBox, the icon appears. Instead of the promised pay-outs or winnings, you lose money by paying for fake services. If you enter a bank card number or other electronic payment data, fraudsters can steal money from your account. The situations described below occur on fraudulent or infected websites, and due to malware on your computer. Fraudulent websites may look very similar to real ones, but a site that was safe yesterday may be infected today. Attention. Malware may intercept information that you enter on websites and send it to hackers. Therefore, we strongly recommend using antivirus software. They offer large online earnings and promise nice rewards for viewing websites and videos, reading ads, filling in questionnaires and tests or writing comments on forums. You agree to do it, you work for a while, your earnings are displayed on the screen, and they keep growing. At some point you are told you can get paid, but it turns out that you have to make a preliminary payment first (to cover registration, personal income tax, VAT, or power-of-attorney fees so that someone can retrieve your funds from a distant location). Usually the request is for less than 400 RUB. After making the payment, you don't receive any money and your payment info is sent to hackers. They suggest that you install a program that will automatically earn money for you on a device. You install the program, but all it does is notify you of the need to update. You have to pay to update the program and it usually costs 200-400 RUB. Malware that hijacks your personal/payment info is typically installed along with the program. They suggest playing a lottery or going to a site where they hand out money to anyone who needs it. You start playing and win a lot of money, or you send a request for financial assistance and get a positive response. They inform you that to claim your winnings or financial assistance, you need to pay a small amount (about 400 RUB) as a foreign exchange fee, VAT, income tax, and so on. Do not install software from unverified sources. Do not enter personal information and electronic payment data (bank card numbers, PIN numbers, etc.) on websites, unless this is actually required. Check the addresses of web pages where payments are made. The page address may show that you’ve entered a phishing site. Attention. If you want to disable protection from internet fraud, you will have to completely disable protection from malware and malicious sites in the browser. We strongly recommend that you don’t do this. Use the same sequence of actions to re-enable internet fraud protection. If you believe that your website has been mistakenly included in the list of websites suspected of internet fraud, please contact us using the feedback form.